Finally made it Frankielucy Bakeshop in Silverlake after a spending a few hours at the Lotus Festival in Echo Park. 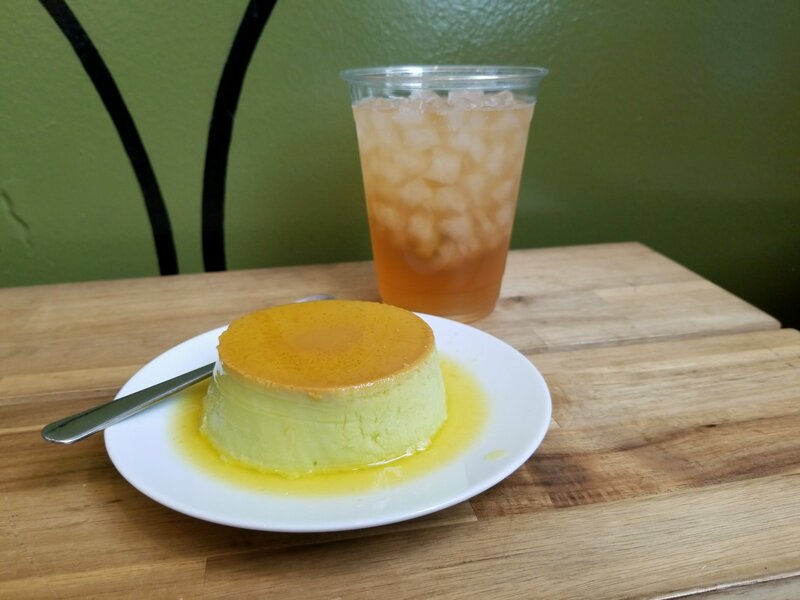 Espresso drinks, baked goods, and the infamous Créme Caramel (a flan or a custard or a pudding) are all the good things one can find in this LA hipster neighborhood. From what I gathered, FrankieLucy Bakeshop is the partnership efforts of Found Coffee and Créme Caramel LA. 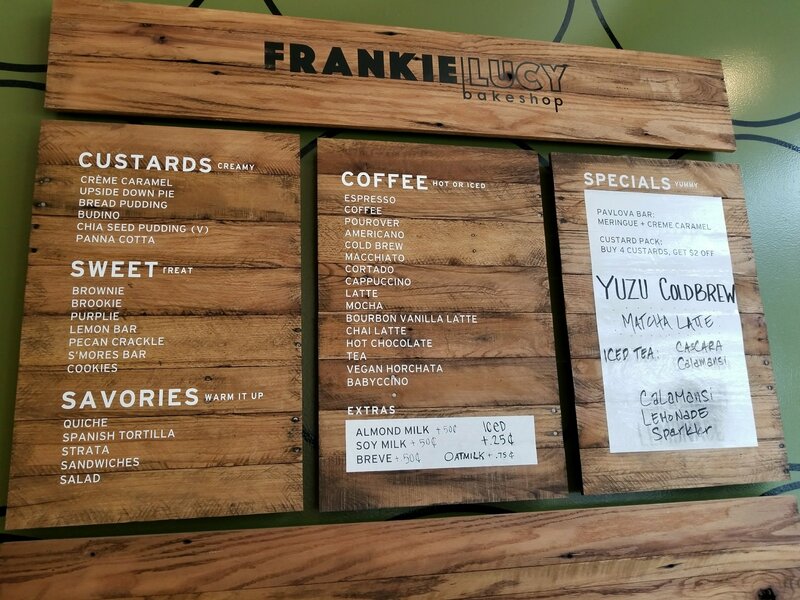 Both are established businesses in the LA area that joined forces to bring dessert and specialty coffee to the masses. I am very familiar with the many varieties of desserts from Créme Caramel. My favorite is still the original Créme Caramel, the second favorite the Ube Créme Caramel, and my third favorite is the Vegan Coconut Pandan Chia Pudding. 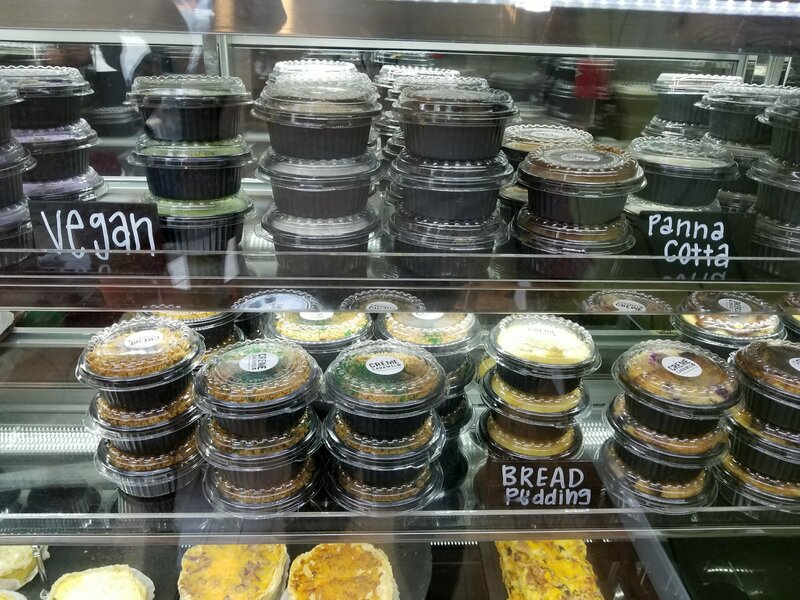 Of the all baked goods, I personally favor the Ube Bread Pudding and the savory Spanish Tortilla. My friends were happy with their purchases. 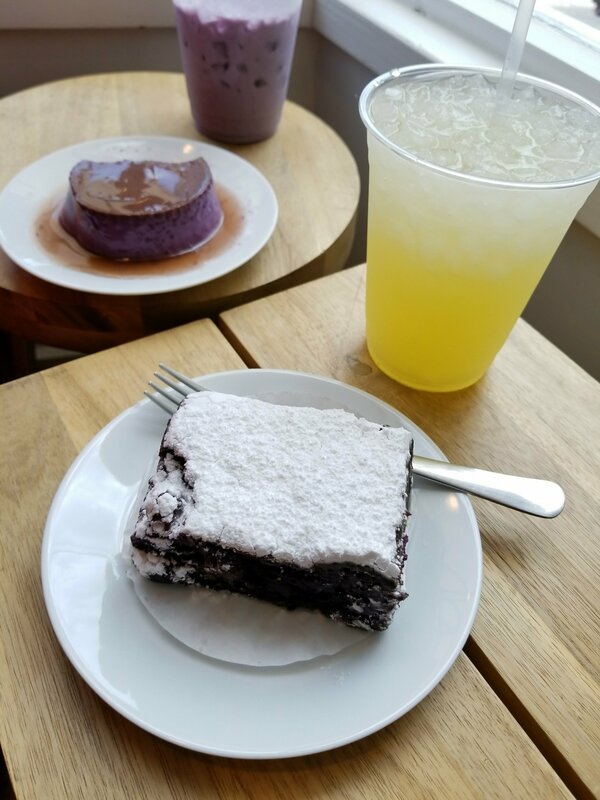 I broke away from my usuals and got a Purplie, which is a Ube Brownie. Love this dessert! 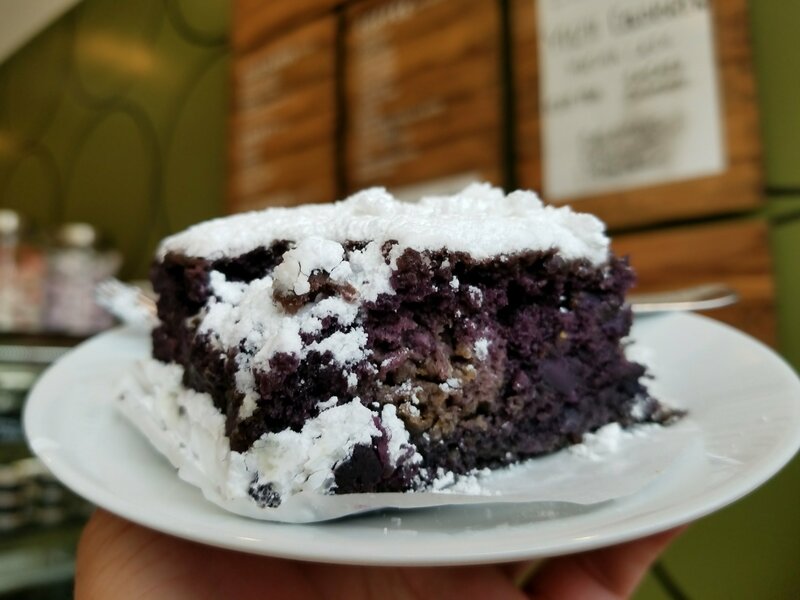 It’s obviously made just like a regular chocolate brownie, but with Ube (a Purple Yam). 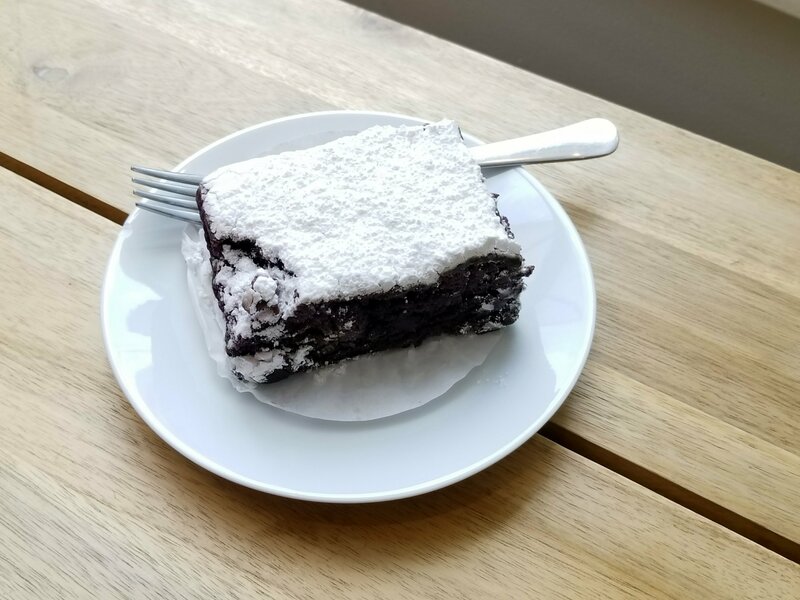 It tastes just as sweet as a regular brownie and has the same fudgy texture. To quench my thirst, considering it was a very hot summer day, I ordered a Calamansi Lemonade Sparkler to drink. This fabulous citrusy beverage in sparkling soda water is just as refreshing as lemonade, but without the tartness. Limited paid street parking on Sunset Blvd or a decent walking distance with your pets from the neighborhood side streets for free parking. Yes, bring the pooch as this Coffee-bakeshop is dog-friendly. $, Cash, Credit Card, Apple Pay, Limited Street Parking, Dog-friendly.